Apple's iOS 5 integrates features better Twitter integration. Android's Ice Cream Sandwich updates it's Contacts app to People. In reality, both operating systems are playing catch-up. Apple has a long way to go. Ice Cream Sandwich is knocking on Windows Phone 7 door. Windows Phone 7 has always been activity-centered rather than app-centered. It created a concept of hubs where you focus on an activity like "people" or "pictures" rather than what app would I need to post a message to Jane Doe on LinkIn or what app should I use to upload a picture to Facebook. In fairness, Android user interface like HTC Sense. HTC Sense integrated Twitter, Facebook, LinkIn, Flickr, Plurk and Twitter into your People and Friend Stream apps long before Windows Phone 7 came out. If you were wondering why so many people like HTC's Sense, well it is mainly the way it links you contacts across all the services you actually use to contact that person, and does everything under a common looking interface. Still it is not as good as baking it into the OS. That is what Windows Phone 7 did. About eleven months ago, I saw my first Windows Phone 7 device, and I liked it a lot. 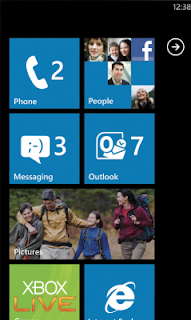 Other then the People hub there are a lot of smart innovations on Windows Phone 7. iOS 5 requires you focus on 20 elements on screen at a given time without giving you any relevant information without having to open an app. In fairness iOS 5 has now added two non-customizable widgets and Android like notifications which greatly improves the operating system. Android has its informative widgets which can be pleasing to use in well integrated systems like HTC Sense, or can become like a cluttered desktop when you start using widgets from different apps which display things and operate in different ways. Windows Phone 7 created a Live Tile system, where which basically limits you to having focus at between 4 to 8 elements at a time, and basically integrates the concept of an Icon and a Widget. Still a lot of work to be done, but it does strike a nice balance between simplicity and complexity. What Windows Phone 7 lacks is up to date hardware support. Like Apple's iPhone, you won't see any true 4G Windows phones this year. Windows Phone 7 also does not support screen resolutions higher than 480 x 800. Windows Phone 7 also does not support dual core processing, which means no 1080p video recording and playback. There is nothing that can be done about that. In a few days time, we will see the Windows Phone 7 operating system gets it second public launch. While Windows Phone 7 launched a year ago, many people do not even know it exists. The mistake Microsoft made last year was not getting phones into the hands of consumers. When the first Windows Phone 7 device came out in the Philippines last year, the HTC 7 Mozart it was priced at the same level as Apple's iPhone. As you can expect, adopting was slow, almost to the point of non-existence. In eleven months I do now know anyone personally who own a Windows Phone 7 device. As against HTC's own Android offerings, it was priced at the same level as the HTC Desire HD (at least locally) which has a larger screen, supported faster 3G connectivity and Angry Birds. I know it is a small thing, but did you really want to buy a phone in 2010 that could not run Angry Birds? It is a year later. Nokia is set to launch its first Windows Phone 7 device, and really no one cares about the fact that it is a Microsoft Windows Phone 7 device. When Nokia launches it new phone people will be looking at the new Nokia phone. I have no doubt they will be amazed by the operating system. The hardware will be underwhelming mainly for lack of dual core and higher screen resolution support. What will make or break this re-launch is price. If the Nokia 800's price bumps heads with the iPhone 4S and the Samsung Galaxy S II, it will be a repeat of last year. No doubt, many will buy it simply because it is the best Nokia Phone in the market. But if Nokia, and Microsoft get together, and place it at price point where is challenges phones like the HTC Desire S, Apple iPhone 4 or LG Optimus Black, I think it will sell like hotcakes in Nokia's bailiwick markets. Basically, Nokia, and Microsoft needs to get the prices of the phones right, even if they have to subsidize handset costs. Nokia and Microsoft needs to get Windows Phone 7 devices into actual peoples hands. It is only in this way that people will finally get to see what is probably the best mobile phone operating system in the world. It really could be their last chance. Google's Ice Cream Sandwich will be on phone in the market in a month and will be common place by the first quarter of next year. And, yes Android has pretty much caught up on Windows strengths, and has features that Windows Phone 7 still cannot touch. Well, just a few days to go to find out whether mobile will be a three horse race (yup am counting BlackBerry out) or whether it is time to write the epitaph for Windows Phone 7 and Nokia.